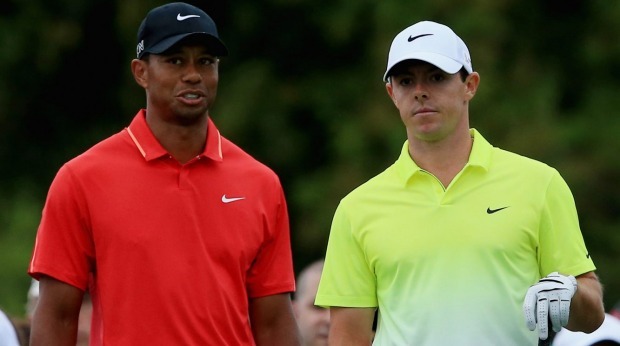 Rory McIlroy gets to check out Tiger's action on Thursday and Friday. Things got pretty ugly early Sunday at Pebble Beach. And we’re not talking about Paul Casey’s swing. Hail, rain, wind, the whole nine yards sent things into a tizzy and the AT&T finally ended early Monday morning. The weather has followed AT&T champion Phil Mickelson to Los Angeles. The Wednesday forecast for the pro-am was calling for an 80 percent chance of showers and temperatures that won’t reach 60 degrees. Things won’t get any better for the first round on Thursday. There’s a 100 percent chance of rain and, perhaps more concerning for the field, winds that are forecast to gust to 15 mph. The good news for tournament officials is that the chance of rain goes down on Friday and over the weekend. So it may boil down to who can best tolerate the elements on Thursday. Rory McIlroy is back in action and he’s been thrown right into the deep end of the pool. He’s paired the first two days with Tiger Woods and Justin Thomas. There’s the Super-Bombers group — defending champion Bubba Watson with Dustin Johnson and Cameron Champ. We’ll get to see if Jordan Spieth has recovered from his weekend meltdown at Pebble Beach. He’s got some good competition in his 36-hole pairing — Xander Schauffele and Mickelson. Bryson DeChambeau’s been playing as good as anyone in the world and he’ll play with Matt The Cheapskate Kuchar and Jon Rahm. Overall, it’s a strong field. After that things should be just fine.